A month after accusing neighbouring Sikkim of fomenting trouble in Darjeeling and dealing out cash to fuel the Gorkhaland agitation, West Bengal Chief Minister Mamata Banerjee on Friday said the "misunderstanding" between the two states has been resolved. "Whatever misunderstanding was there between us centering the Darjeeling issue, is over now. I think it is good for the people of Darjeeling. 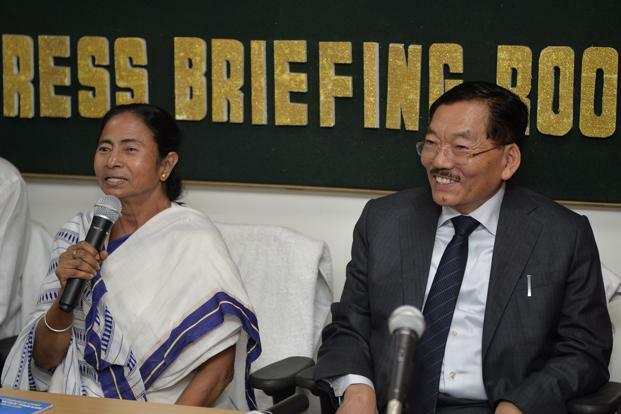 It is good for both Bengal and Sikkim," Banerjee said, with her Sikkim counterpart Pawan Kumar Chamling by her side. Terming the meeting with her Sikkim counterpart at 'Uttar-Kanya', state's administrative headquarters in north Bengal as fruitful, she said both states are now ready to forget differences of the past and work together for betterment of each other. "We want good understanding between the two states. We will sort out whatever small issues and misunderstandings were there between us. Mr. Chamling also said the same. We will work together. I think this a good stepping stone for the two states to come close to each other. "If the two states can stay together and work unitedly, there can be more development and higher inflow of tourists in both the states," she said. Echoing Banerjee, Chamling, who once openly supported the Gorkhaland agitation and wrote to the Central government seeking its intervention in solving the Darjeeling unrest, also said that the misunderstanding between the two states is now a past incident. He vowed to work together with Bengal for the betterment of both states. "Now we will work together for the development of Sikkim and Darjeeling district in West Bengal. Our discussion was on developmental issues. "Whatever misunderstanding was there before, that is past. Now we (Bengal and Sikkim) will move together for our better future and better relation," he said. Referring to the strategic importance of Siliguri in north Bengal that is called the 'chicken neck' as it connects India's northeastern states to the rest of India, with the countries of Nepal and Bangladesh lying on either side, Banerjee said Sikkim's location is equally important from the northeastern point of view. She also said there would be no impediments on the interstate movement of vehicles between Bengal and Sikkim and asked the administrative officials from both the state to discuss and sort out the issue. "Their vehicles would come to our state and our vehicles would go to theirs. The administrative officials of both the states would sit and discuss the matter," she said. The Trinamool Congress supremo, who recently organised the first ever hill business summit in Darjeeling, assured that her government would invite Sikkim from the next industrial summit held in Bengal. "We could have called Chamling in the recent industrial summit here. From the next tie we would invite Sikkim in our industrial summit. It would be good as the industrial circuit of both the states would be developed," Banerjee said. "I would also appeal to the GTA to maintain a good relationship with Sikkim," she added. During her visit to strife-stricken Darjeeling in February, Banerjee alleged that people from Sikkim of giving out cash to keep the disturbances alive in the north Bengal hills. She claimed Sikkim and a few foreign countries are eager to tarnish Darjeeling's image as a world famous tourist destination as it would, in turn, benefit them. Her statements had evoked large scale condemnation by Sikkim's leading political outfit Sikkim Democratic Front (SDF) that suggested Banerjee to solve the Darjeeling dispute on her own rather than blaming other states for it.